This add-on is included with your purchase of the Developer, Plus or Pro edition. 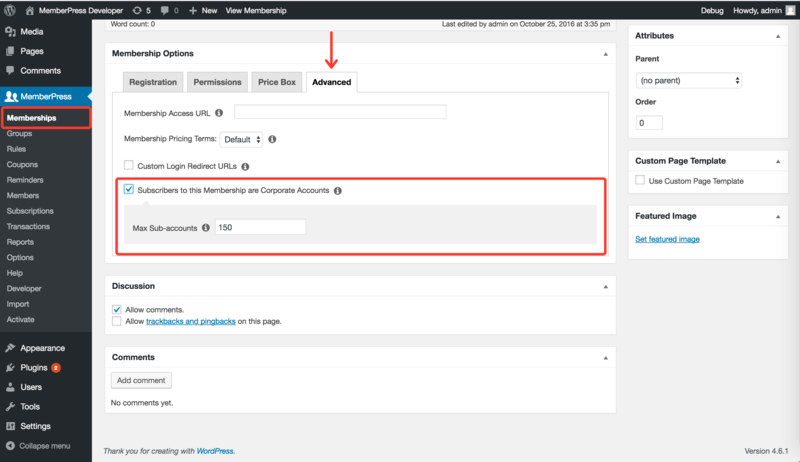 The MemberPress Corporate Accounts add-on enables you to specify a membership with a parent and any number of child or sub-accounts. For example if you have a corporate user and they need a membership that allows them to sign up their employees. Or if your membership is for parent and their children need to be associated with their account. The Corporate Accounts add-on has the following requirements. Alternatively you can also download and install the Corporate Accounts add-on with the download link on this page. Now that the add-on is installed, next create or edit a membership for your corporate (or parent) members to sign up for. To do that, create a membership through the MemberPress > Memberships > Add New button (or simply edit an existing membership). In the Membership Options, select the "Advanced" tab. Check the box "Subscribers to this Membership are Corporate Accounts" and set the number of sub-accounts allow for this membership. Once this is setup every member who signs up for a membership will have the ability to add whatever number of sub-accounts you allow to their membership without paying. These sub-account members will have access to everything their parent corporate account member does (except for the corporate account member's account information and billing information). Any member that signs up for your corporate account membership will become a parent member for this membership. After they sign-up you can manage them by editing their member profile. Near the bottom of the member's user profile you'll find the "Corporate Accounts" section. This is where you'll be able to change the limit of sub-accounts as well as easily navigate to the sub-accounts. 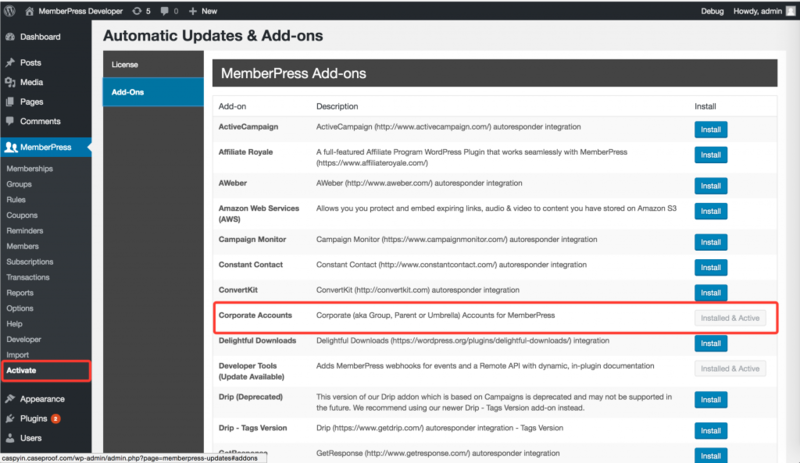 Both the WordPress Admin and the corporate account user can manage sub-accounts. For a break down of how each of these looks, please see the respective sections below. X of X Sub Accounts Used - Here, the user will see how many of their allocated sub-accounts have been used. An example may be: 10 of 20 Sub Accounts Used. Existing Username: Your corporate user can use this entry form to put the username of an existing user on your site to add that user under their corporate membership. The field does not support entry of the user's email, or move an existing user if they are currently associated with another corporate account. Username: (Required) Used to enter the username that will be associated with the sub-account. Please note that usernames cannot be changed once submitted, so it's important that this is entered correctly. Send NEW members the welcome email: (Optional) Check the checkbox next to this option to send the sub-account Welcome Email that appears in the MemberPress > Options > Emails tab > Member Notices section > at the very top after you have installed and activated the Corporate Accounts add-on. This email can be edited there as well by the site admin. The email is sent to the email entered above. Search Sub Accounts - Corporate account can use this search bar to search for sub-accounts in the table below it instead of manually searching each page. For best results, search by username or email. Sub Accounts table - Here, your corporate account user will be able to see all sub-accounts associated with their Corporate Account. The table will show the sub-account's username, email, first name, last name, and also give the option to manually remove any sub-accounts with the "Remove" link next to each entry. Previous/Next Page: The Corporate Account user can use these options to manually scroll through the pages of sub-account users. 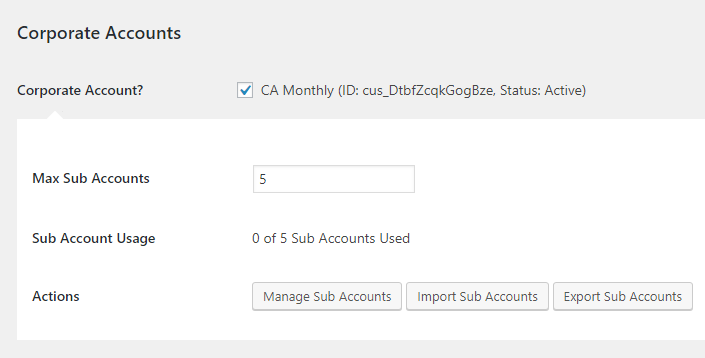 Export Sub Accounts: Clicking on this option just below the sub-accounts table will export all sub-accounts associated with the Corporate Account user. Signup URL - This is a simple URL that the Corporate Account user can copy and send to anyone they would like to subscribe under their membership. Use the clipboard icon to easily copy it. Send NEW members a password reset link (does not email existing members): Sends the user a simple password reset link. Your Corporate Account user should use this option if they don't already know the sub-accounts passwords. This is because the welcome email cannot include any password information. Send NEW members the welcome email if they haven't received it already for the membership: This is the same welcome email mentioned above in the "Add Sub Account (button)" section. 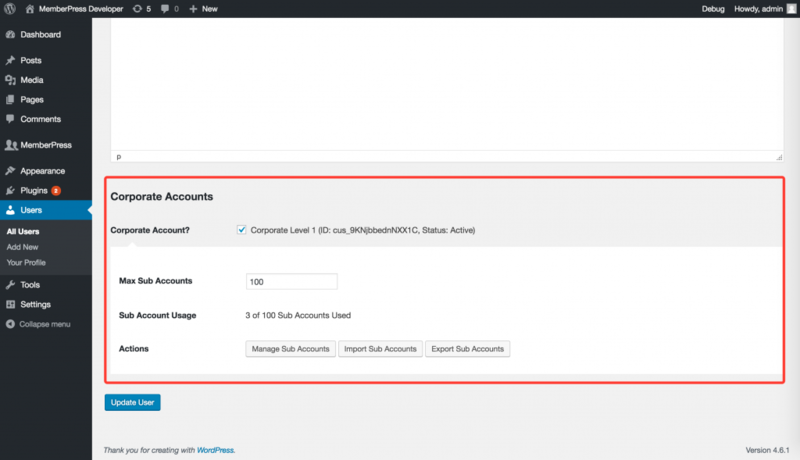 As the Administrator you will be able to manage sub-accounts by going to the user's profile and selecting the "Manage Sub Accounts" button in the "Corporate Accounts" section. Corporate Account? - This option will be checked by default if the user is already a corporate user. You can un-check it at any time though to revoke the Corporate Access that the user has, meaning that all sub-accounts under this user will lose access. 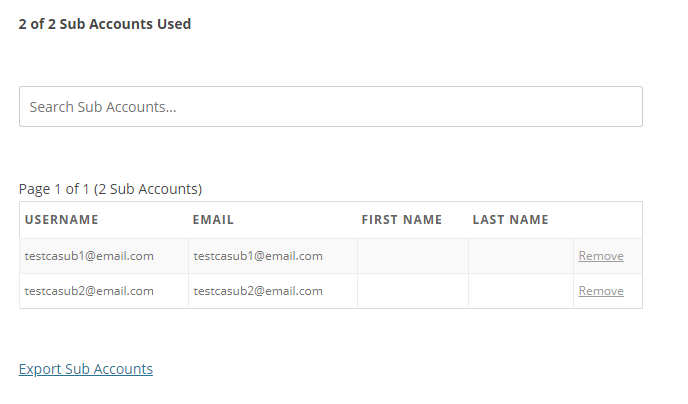 Max Sub Accounts: Here you will be able to see the maximum number of sub-accounts allotted to the user. The max number of sub-accounts can be edited by entering a different number and updating the user. Sub Account Usage: This will tell you as admin how many of the allotted sub-accounts have been used for by this Corporate User. An example may be: 10 of 20 Sub Accounts Used. Actions: This section will show the following action buttons. Manage Sub Accounts: Clicking on this will take the admin user to the Corporate Account's sub-account managing page. The power here being that the admin can then do all of the same things that the Corporate Account user can do from their Account page. Import Sub Accounts: Clicking this button will take you to a special import page of our Importer plugin (remember that the Importer add-on must be installed to use the Corporate Accounts Addon). Use this page to choose and upload a previously created CSV file. This file has NO limits to the amount of sub-account users you can add, but we recommend doing them in smaller import files to avoid any hiccups (100-200 users per file). For how to format this file, please see the "Formatting the Sub-accounts CSV File" section above. Export Sub Accounts: This button, when clicked, will export a comma delimited CSV file of all sub-account users associated with this parent account. This can be done by going to the MemberPress > Subscriptions page > Non Recurring tab > and search for the sub-account user. On the far right of the table, you will see a column header called "Parent" and under that you will see the username or email of the Corporate Account holder that sub-account User is associated with. With the Corporate Accounts add-on installed and activated on your site, it will add a new "Role" column to the MemberPress > Members page. Here you will see one of three options to tell you what type the user is: Corp Account, sub-account, or None (if they are subscribed to another membership on your site).